A sunny terrace perfect to relax while enjoying the view on the canal. Beautiful apartment on the ground floor in a secure area close to Port Grimaud 1. It has been entirely renewed. With an independant entrance, it is composed of a living-room with a sofa-bed and a well-furnished open-plan kitchen, one bedroom with a double bed and a shower-room with toilets. 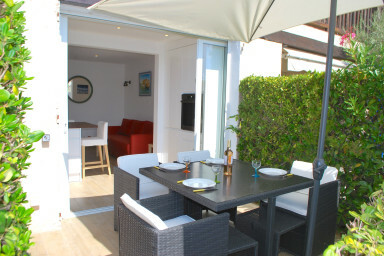 On the canal side, a sunny terrace with a direct access to the quay.